Last week we released CryptoZombies Lesson 4, where we continue our journey to build an army of zombies with Solidity, Ethereum’s programming language. As of this lesson, over 90,000 people have used CryptoZombies and are getting more familiar with developing Decentralized Applications (DApps) on Ethereum. What we have not discussed so far is why should you get involved in this space? What is there to gain? Does it really matter? 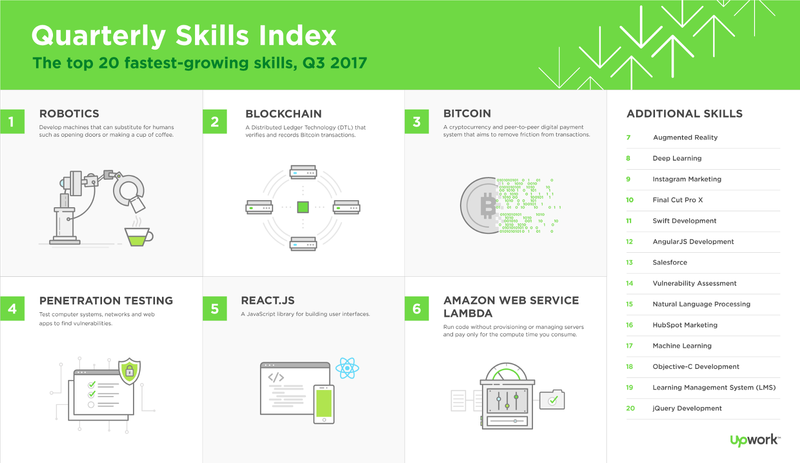 Blockchain and Bitcoin were 2 of the top 3 fastest-growing skills on Upwork’s Quarterly Skills Index in 2017. In this article, we’re going to look at similar historical growth of innovative platforms, and some ways you can start making money as a blockchain developer as you develop your skillset. Let’s take some data from the two biggest app stores of today, Google’s Google Play and Apple’s App Store. 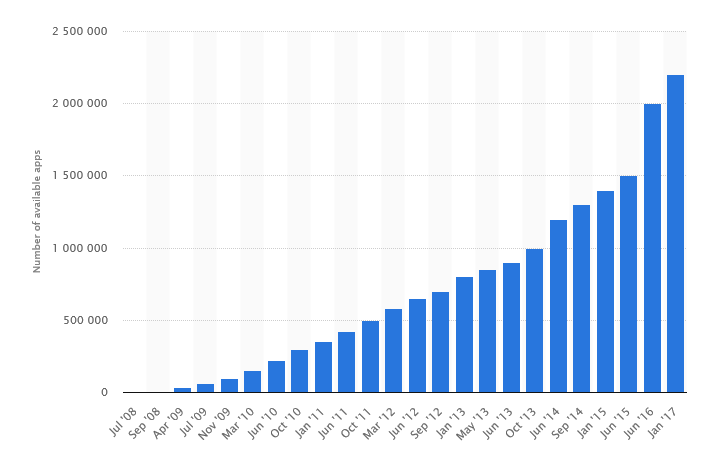 In March 2009 the Google Play store (called Android Market at the time) had 2,300 apps available. By the end of October 2010 that number had increased to 100,000. In February 2017 the amount of apps on Google Play store was around in the range of 2.7 million. If blockchain really is analogous to the internet in the early 90s, then DApps are in an analogous stage to the early-days of the app stores. We are going to see massive growth in DApp software developers over the coming years. What actually matters here is not if the above happens. It is when. Should you really look into this? …then you should get familiar with blockchain development. Currently individuals, startups and even larger companies are gradually joining the blockchain industry with their own products and they are actively looking for more employees to join their projects. There are a number of ways you can start making money building DApps, depending on your current skill level. Taking CryptoKitties as an example, you can build a monetized DApp. There is huge potential here — CryptoKitties did over $12 million USD in sales in its first month after launch. If you look on DappRadar, you can see the volume of transactions different DApps are doing, with CryptoCountries currently topping the list at almost $40,000,000 in sales over the past 7 days. The developers take 2–5% of every transaction, so you can do the math and see what a profitable opportunity building your own DApp-based game can be. In our next article, we’ll be covering in-depth the different business models you can use in your DApps to generate profits. 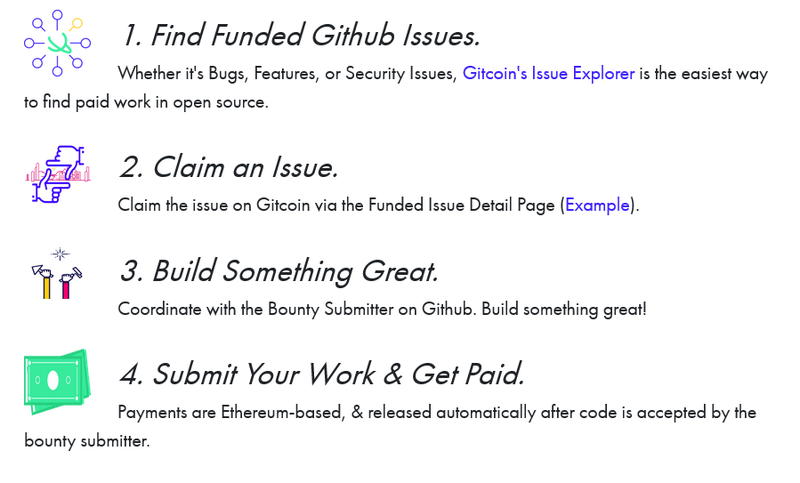 Gitcoin aims to ‘push open source forward’ by attaching bounties denominated in Ether for solving github issues. Currently, there are more than $8.000 attached among 20 bounties, waiting to be claimed! All you need to do is solve an issue, and if the bounty submitter approves it, you will get paid in Ether via a smart contract. Launching an Ethereum token that is secure and can be used to trade value is as trivial as writing a few lines of code, thanks to OpenZeppelin. After you develop the coin, you can raise capital through an Initial Coin Offering (ICO). Of course, your project must have some kind of value in order to raise the required capital. (Or not, as has been the case with many high-profile ICOs — but that is another discussion). If building your own startup isn’t your thing, you can get hired as a developer on someone else’s. There are a number of new projects springing up all the time that are looking for developers. Many of these projects raise millions of dollars via an ICO, and have a large budget for hiring skilled developers. You can take a quick look at AngelList and apply for a position that interests you. Because blockchain developers are in such high demand, many of these offer working remotely, which is a big plus for many. If you prefer flexible and on-demand gigs, popular freelancing sites such as upwork.com or freelancer.com have job listings on potential projects that you can work part-time or on a per-project basis. You can search for positions such as Solidity Developer or Blockchain Engineer at these sites to grasp an idea of what positions are available. Lots of big companies hire from time to time, trying to explore their own corporate solution. However, judging by Visa asking for 8 years of Industry experience, then you’re either Satoshi Nakamoto or drinking margaritas on your private island. Usually these jobs are not oriented towards fully public and decentralized systems, so if you’re a blockchain purist, this may not be your cup of tea. As more and more resources on learning to code these unstoppable applications become publicly available, aspiring developers will be able to transition smoothly from traditional development to blockchain development. At Loom Network, we are contributing to this effort by building a community around tools and tutorials for learning to build DApps on Ethereum, the fastest-growing blockchain developer platform. Head to CryptoZombies.io, our interactive code school that teaches you to write Ethereum DApps through building your own crypto-collectables game. Join our Telegram community to join a thriving community of people talking about DApp development and scaling Ethereum. Check out our Medium page for our other articles on Solidity development. Hope to see you in our community, with the other developers who are on the forefront of this industry!